With any project, time is money. This statement is even truer when it comes to a commercial construction project. With the scale of a commercial project, each decision becomes even more important – including choosing the right insulation contractor. Check their experience. Commercial insulation is a specialty. It’s important to know the contractor has experience in commercial insulation. They should confidently answer questions about fire ratings, codes, etc. Up to date on new technology. A savvy commercial insulation contractor will recommend new technologies for your project that can help improve performance, aesthetics and more. A professional commercial insulation contractor will be up to date on developments in their industry, and be able to recommend new products and install methods to make your project even better. Insured and licensed. It goes without saying that an insulation contractor should hold the proper insurance and licensing to do commercial work. If you have any doubt, ask. Large installer base. Don’t wait until scheduling day to find out if your commercial insulation contractor has the bandwidth to complete your install in a timely fashion. Confirm your contractor and adequate number of installers available to handle your project when install day comes. 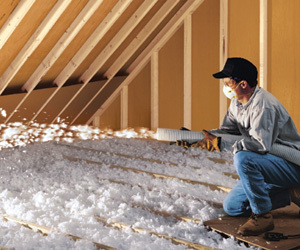 Delmarva Insulation has vast commercial insulation experience, is up to date on new commercial insulation technologies, is properly licensed and insured, and has the bandwidth to complete your project in a timely fashion. To get an insulation estimate on your commercial project, contact our office.